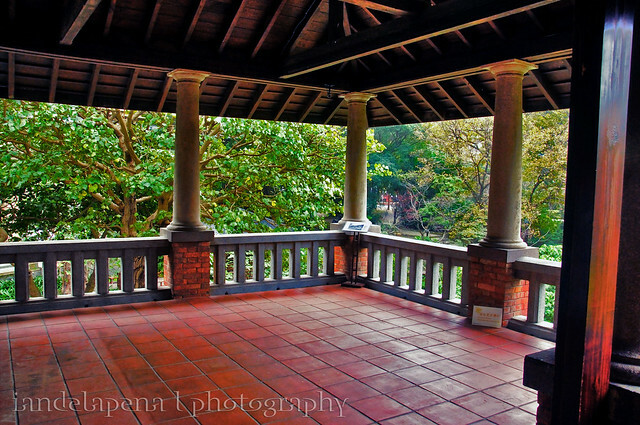 During the Japanese occupation one of the best things that they gave to Taiwan (in my opinion) is the Hot Springs culture that a lot of people enjoy now-a-days. 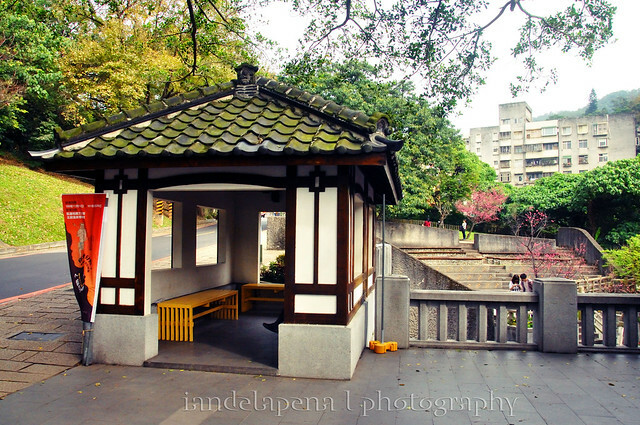 Through time Taiwan’s adapted to this culture and a good place to see how everything evolved to today is the Beitou Hot Springs Museum. 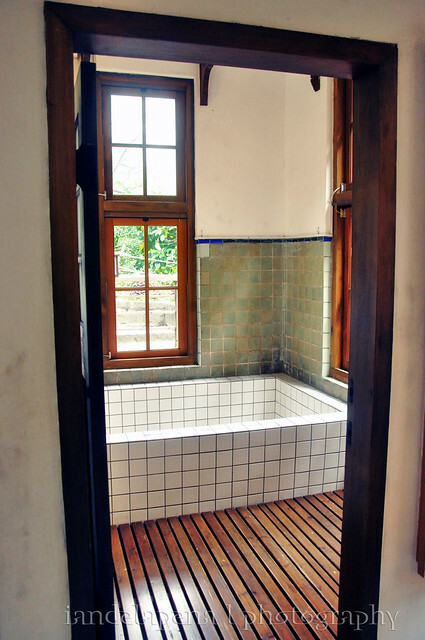 Housed in an old Japanese bath house made of brick that was found by a group of students working on a project. 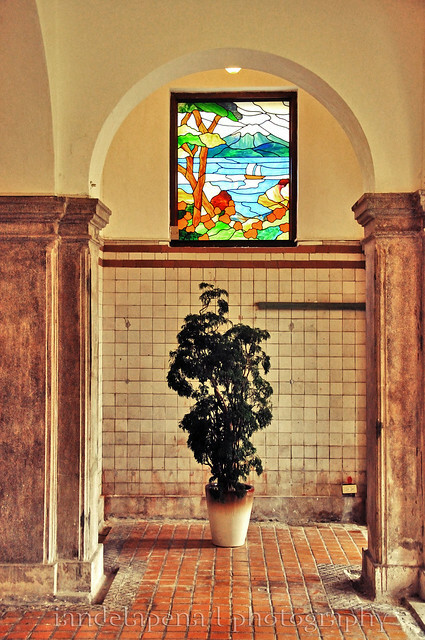 They then informed their local authorities about their discovery, They found out that it was an old bath house so the local government turned it into a museum with the help of the community. 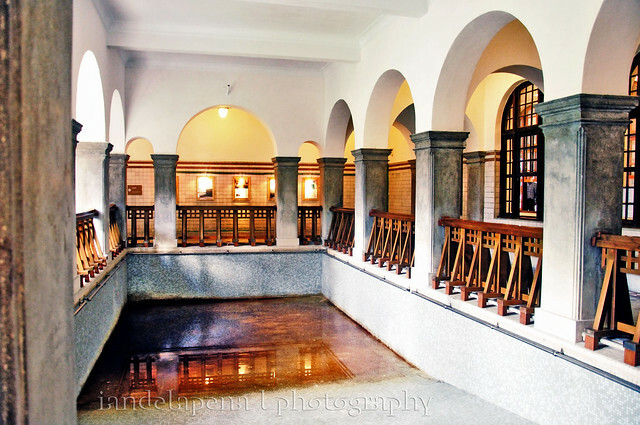 The museum is located just right after the beautiful Taipei Public Library and can be access on both Guangming and Zhongshan roads which you will see being separated by a park at the middle upon alighting from the XinBeitou Station (新北投站). Upon entering the museum you will be asked to leave your shoes in a divider and change into comfy slippers, now you are ready! As you go around, you will be presented with the history of how Taiwan developed its hot springs into what we enjoy today. There are lots of diagrams and visual presentations that would teach you a lot of things. Though I would suggest to bring a companion that could read Chinese since most if not all of the exhibits are written in Han. 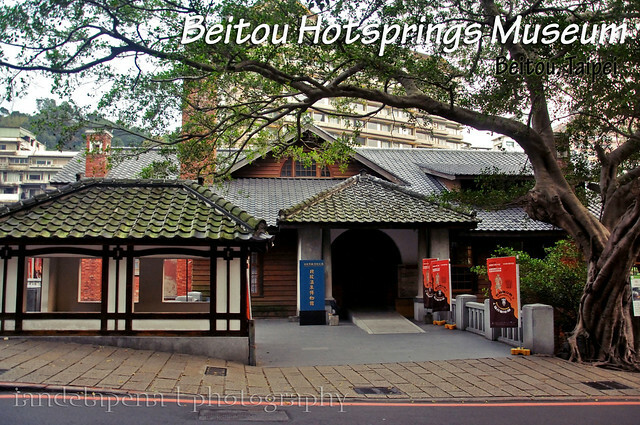 Beitou’s hot spring waters are enriched with minerals by sulfuric rocks which they also have on display. 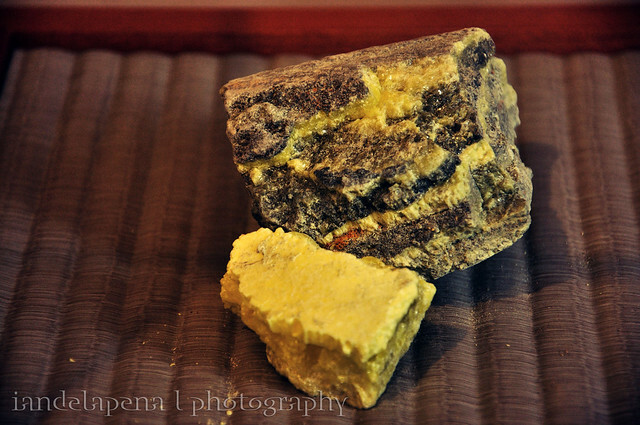 These rocks are responsible for the healing qualities of Beitous hot spring water. 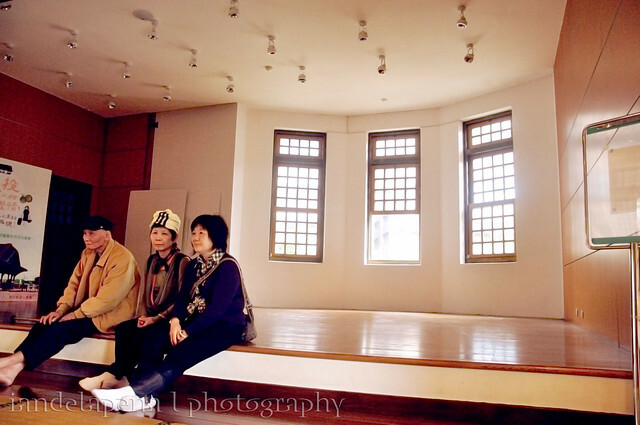 The much more interesting parts of the museum are the rooms that were restored and saved from deterioration. Just behind the shoe depository area is a spacious Japanese tatami room where you could feel as if you are really in Japan. I think that the Tatami Room is more of a place where they watch performances before as it features a stage at the other end of the room. I am not sure if these trees are cherry trees but they have bloomed already, there are actually quite a few of them around the museum grounds. On the Tatami room’s right wing a beautiful wooden corridor that connects the main hall to a terra cota veranda and another room that houses priceless memorabilia (which were off limits for cameras). The museum also features a cinema room where they show movies that were shot in the buildings years ago. After seeing the main floor the museum I went down stairs and discovered more things about the heritage that the building has. 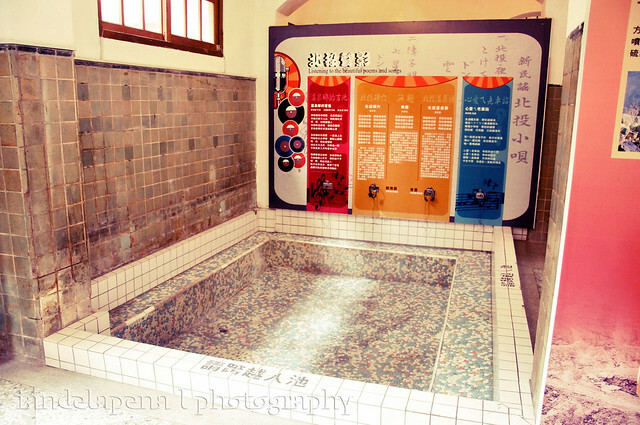 The lower part of the museum is the hot spring pools are located, some of them are even equipped with audio devices that you can listen to while sitting in one of the pools . 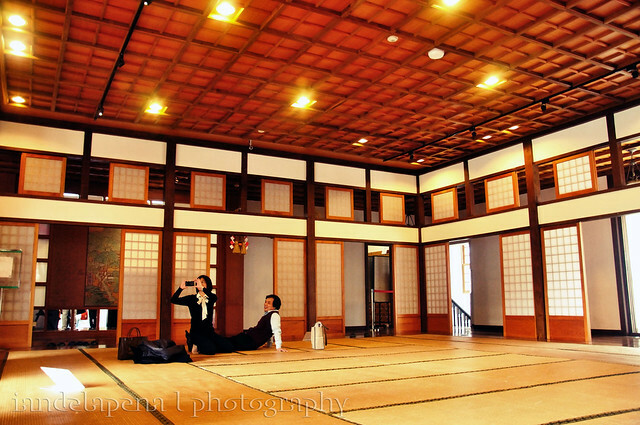 You will also find a big pool at the center of the lower level, I think this is just right below the Tatami room. 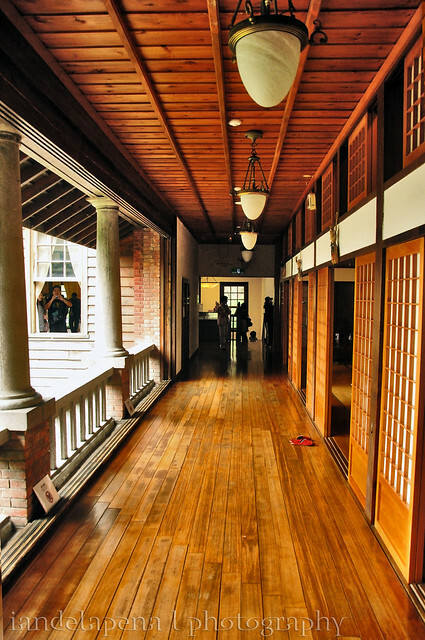 You can really still feel the Japanese vibe while earning about a part of Taiwan’s history as you roam through the beautifully restored mansion. Every once in a while if you are lucky you’d find some performances at the side of the the mansion where an amphitheater is located. Take the MRT alight at XinBeitou Station 新北投站 and take the Zhongshan rd. to your left as you face the park from the MRT station. 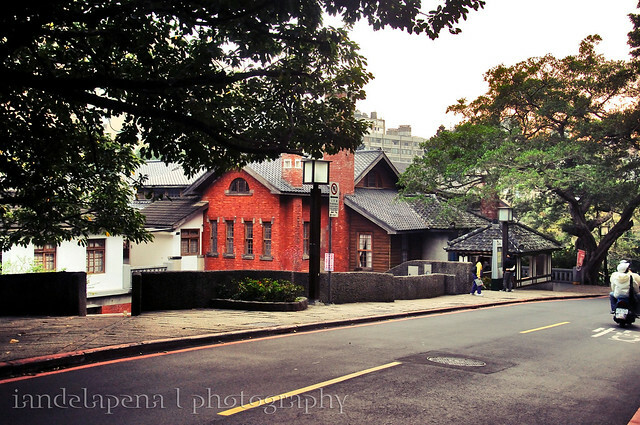 The museum is just several meters away from the corner just right after the Taipei Public Library. Bring along some one who can read Chinese so you can learn more or if you are as thick skinned as I am, don’t be afraid to ask the people around you what does the writings say. Enjoy the Tatami room, I thought that a room like this is just like an ordinary room but now I know the reason why the Japanese can stay on such sitting position for a long time, because it is so comfortable.